You’ve most likely heard about all things cloud. But one of the biggest IT buzzwords also happens to be a relevant strategy for many IT departments. Hosting computing resources off-premises (i.e., in a provider’s data center) has gained a lot of attention recently. Many IT departments still debate over whether they want to adopt cloud computing technologies or stick with a more traditional on-premises server. There’s definitely a large amount of momentum behind the cloud: close to 93 percent of organizations use some form of cloud services, according to numbers from Spiceworks. So, what are the top pros of cloud and on-premises to keep in mind? Ongoing support is simple and easy. Forget worrying about replacing failing hard drives or patching firmware, and forget tedious system maintenance tasks! Switching to a cloud service can stretch as much or as little as you need it to. Even if you just need a website for a few months or years, you can easily and efficiently set up the cloud and shut it down whenever you please, without having to buy any hardware. Getting started with the cloud can be as simple as filling out an online survey and clicking “send.” Compare that to procuring hardware and project managing and installing! With the cloud, you pay-as-you-go and scaling up takes place behind the curtains. Although scaling typically takes time and requires deploying new servers, with the cloud, it’s quick and easy! Someone else maintains public cloud infrastructure. With a public cloud, there’s ZERO hardware for you to maintain. The cloud service provider (not you) is the one doing all the work, replacing old machines, and ensuring security is always up-to-date. Although servers are the default setting for on-premises IT companies, the cloud has its perks. Some companies choose the server over the cloud because they don’t like the idea of their data residing on someone else’s server, potentially in a different state or country. However with the cloud, you can get started right away free of charge and free of installing any hardware. Though it’s always important to be aware of your liabilities before diving into anything. Ultimately, the choice between the cloud or on-premises work depends on the needs and wants of your organization. Many companies choose to do a little of both. You can get the best of both worlds by mixing the cloud and the server… the choice is yours! Cloud computing is a topic that, often times, many people find confusing. However, it isn’t as complex as it may sound. In fact, most people who claim to not understand cloud computing are part of the majority that use it daily. Users are able to utilize a supply of computer research without having to actually manage the equipment needed to generate it themselves, which ultimately saves businesses valuable time and money. 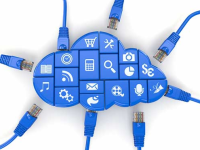 The first key characteristic of cloud computing is the adaptability that it offers. Cloud computing is ideal for businesses with growing demands because it allows you to quickly adapt to changes without your business skipping a beat. The flexibility of cloud computing is a real advantage over competitors — it’s no shock that IT Directors and CIOs are ranking high as a top user for cloud adoption. Businesses of all sizes should be investing in robust recovery. According to Aberdeen Group, small businesses are twice as likely as larger companies to have utilized cloud-based recovery solutions. 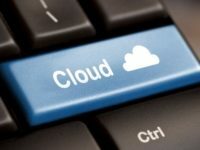 Cloud computing saves time and money by preventing data loss in the first place and avoiding large upfront investments. One of the top advantages of cloud computing is that the software is out of sight and out of your hair. Suppliers take care of them for you and complete daily software updates — so that you don’t have to worry about wasting time maintaining the system yourself. This leaves you free to grow your business and focus on important business operations. When your teams can access and control documents anywhere and at anytime, they’re able to collaborate more effectively together and produce stronger results. Cloud-based workflow and file sharing apps helps your employees stay on task, make updates in real-time and allows them full visibility of their tasks. Do you know what’s worse than a lost laptop? A lost laptop that holds an expensive piece of kit full of sensitive data inside it. Cloud computing gives you security when this happens. Because your information is stored in the cloud, you can access it no matter what happens to your machine. You can also remotely erase data from lost laptops so that it doesn’t get into the wrong hands. How do you make your business more competitive? Moving to the cloud grants access to enterprise-type technology, for all. It helps smaller businesses act on par and, in some cases, faster than large, established competitors. Not moved to the cloud yet? Beanstalk Computing can help. If you feel ready to take the next step towards migrating to cloud computing or if you have any additional questions you’d like answered, Beanstalk Computing is here to provide guidance, advice and help to all business owners. 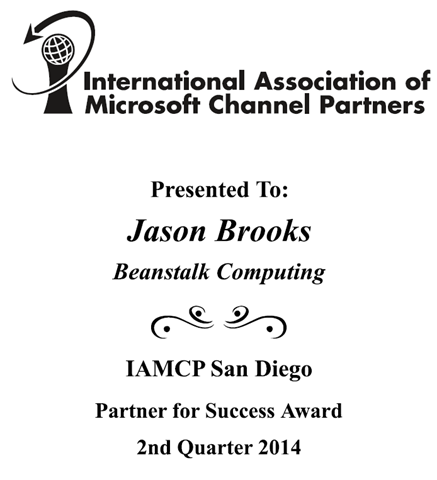 We are proud to announce that Beanstalk Computing has been given the silver level competency status in the “Microsoft Small and Midmarket Cloud Solutions” partners program. This program and award is designed to recognize a business’ competency in cloud computing, Microsoft’s cloud services and Microsoft Office 365. Here at Beanstalk Computing we are incredibly proud of this new partnership status as it shows our successful commitment to the best possible service in the deployment of IT cloud solutions and Microsoft products. 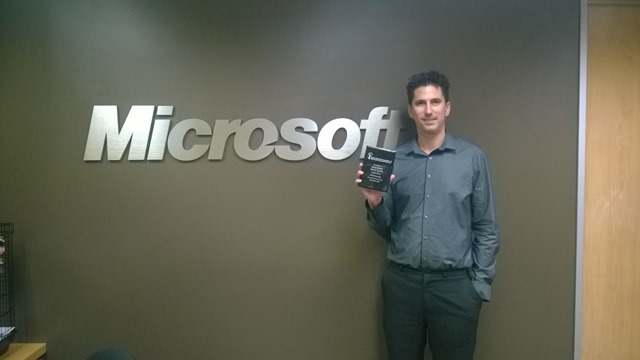 However, this partnership is more than just an award from Microsoft. The Microsoft Partner Silver Competency offers us new benefits, and these benefits will allow us to do an even better job of helping you focus on the business side of your company, rather than the technology. And, with the constantly evolving world of IT and cloud computing, this partnership demonstrates Microsoft’s confidence in our ability to handle the challenge. If you’d like to hear more about how our Microsoft Partnership can benefit your business, or if you’d simply just like to talk more about cloud computing solutions, please do not hesitate give us a call at 800-813-0926. Like many business owners, you have probably heard a lot of buzz surrounding cloud computing in recent years. But is your business missing out by not taking full advantage of the benefits behind this new technology? Below we go through some of the many benefits behind utilizing cloud computing technology and why it is important for your business to make the switch. In business, system flexibility is a difficult element to place monetary value on. As such, it is often overlooked and undervalued by most organizations. However, if your business operations are unable to adapt and adjust to changes within and outside of your business, your overall efficiency will suffer. Cloud computing is by far the most flexible and versatile option for your business, allowing you to respond to business changes the very moment that they occur. Cloud environments facilitate adaptability in what are, often times, volatile markets. The influx of business related technology has, for obvious reason, warranted the need for added security for business owners. Let’s face it, the more employees you bring in or third-parties you work with, the greater the likelihood that your network security will be put at risk. Somewhere along the lines, the misconception grew that cloud computing was not as safe as more traditional networks. However contrary to popular belief, cloud computing has great security due to the elevated standards for security placed on cloud computing companies in which they are legally required to comply with. And with the proliferation of business data becoming commonplace, keeping your information safe and secure is of the utmost importance. If cloud computing can, at the very least keep your data safer, then it is well worth the investment. Most modern businesses depend on a large foundation of software to allow your company to perform what it normally would be unable to accomplish. And, with software, comes updates. With cloud computing, these updates will take place automatically, saving your business precious time that would otherwise be wasted to due to the slow integration of updates throughout your business. In addition to faster updates, cloud computing also has a positive effect on deployment making it quicker and more flexible than ever before. The quicker a deployment can be integrated, the less downtime your business will experience and thus the quicker you can then benefit from the changes. Due to the subscription model that many cloud computing companies offer, many of your organizational needs can be achieved at a far lower price point than buying something in it’s entirety up-front. This eliminates a lot of the risk involved in adopting a cloud computing network as well because it allows you to cancel at anytime if the investment isn’t paying off for your business. Likewise, receiving services virtually is far more convenient than the traditional ways of running a network which both you and your customers will appreciate. Collaboration has become a key component to modern businesses, with it becoming more and more commonplace to see workforces spread out across the country or even the globe. 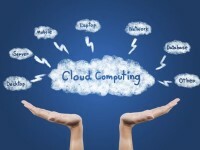 Without cloud computing, this can be nearly impossible to accomplish effectively. When you begin to leverage enterprise mobility, collaboration between workers and departments will happen quickly and easily for your business. Cloud computing allows for one centralized location for all of your business operations, documents and data so anyone within your company can access and collaborate any time it is necessary. For more information on Cloud Computing and how it can help your business, contact Beanstalk Computing at 800-813-0926. 2. Samsung 110 inch 8k Glasses Free TV: 4K was huge at CES this year, every single TV on the show floor was a 4k or better TV. With this much hardware, I am hoping that 2015 will be there year that 4k content blows up. But in the future, 8k TV’s will be next. 8k content is apparently showing up in Japan next year. How much bandwith would you need to to a basic 8k highly compressed stream? Well, Netflix is currently steraming 4k at about 15 megs down. 8k being four times more then 4k, should require then a minimum of 60 megs down. Better upgrade your internet! But for now, we got a glimpse at 8k TV’s from Sharp, Samsung and more. The most impressive was Samsungs 8k Glasses Free 110 Inch TV, WOW! Dell, Samsung, LG, pretty much everyone was showing off their new ultra wide screen curved desktop monitors. The curve could actually work on a monitor, as it is typically viewed by one person and you should always be in the sweetspot. They start at about $1000. But who would want just one? I need at least two. Dell XPS 13: This was the show stopper to me. The most stricking thing about this thing is the screen, there is NO bezle. Its a 13 inch screen in a 12 inch laptop, and it is being sold starting at $799. 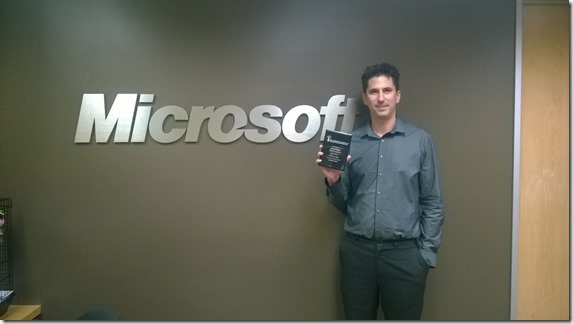 You can get it now at the Microsoft Store in San Diego and around the country. 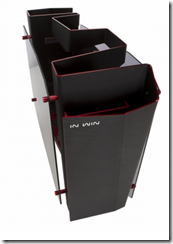 Lenovo LaVie Z: Lenovo and NEC have teamed up to create the worlds lighted 13 inch laptop and hybid. I picked this thing up and I thought it was a mock up or a fake. It was so light it nearly fell UP out of my hands. It was shockinginly light, we are talking 1.7 pounds for a 13 inch comptuer, a full pound lighter then the mac book air! 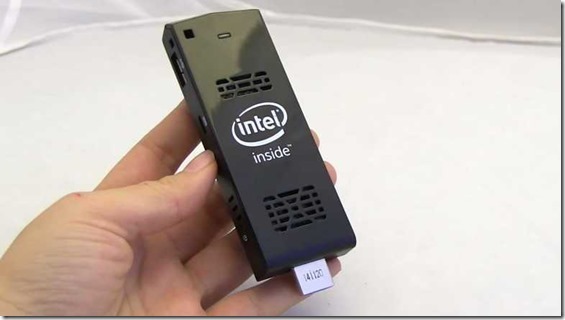 You can turn any HDMI display into a Windows 8.1 computer for $149. This is a tiny little computer for basic users that includes Windows 8.1, 2GB RAM, 32GB SSD, and a fifth generation Core M CPU. There is also a Linux version for $89. There is just enough power here for some light work, web surfing, streaming media, and could be a cheap solution to connect back to a virtual desktop or terminal server. There really is now way to show this on video, you really need to experience it to really get a feel for it. I had the pleasure of testing out the Oculus Rift at CES and I was blown away. The demos they were showing were spectacular. This thing has been in development for years now, and they have worked out many of the kinks. Some of the hightlights in the demo were a scale model of a city that I could walk around, and lower my head right down into the details of the model, moving around and looking at each individual peice. Another demo I was standing on a ledge overlooking a steep drop over the edge of a skyscraper. I felt vertigo just like I was there. In a final demo, I was being shot at and I almost could feel the bullets and shrapnel piercing my skin. 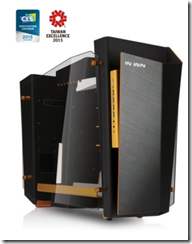 I cant wait until this thing is released! 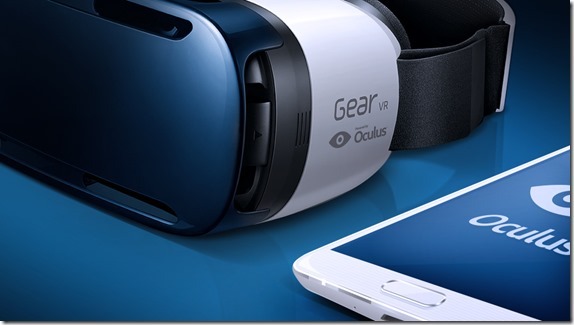 Oculus’ little brother is the Samsung Gear VR which is available now for $199. 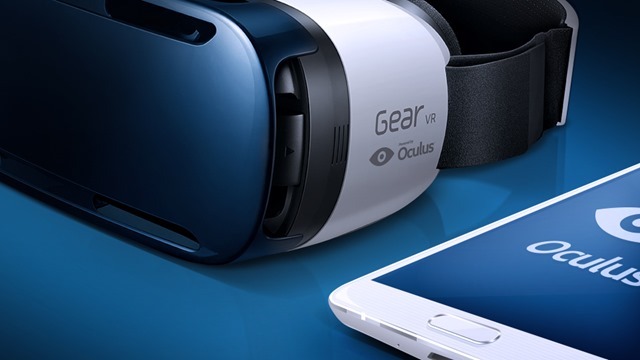 This headset snaps into the Samsung Note 4 Smarrtphone which acts as the brains, display and connection to your virtual reality world. To get started with VR now, this is your ticket to ride! 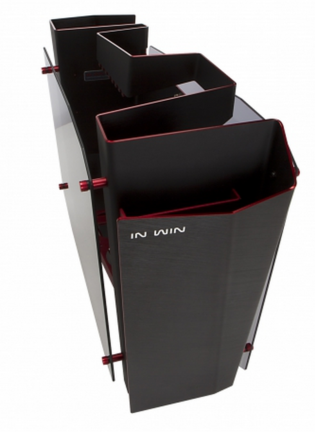 In Win open-frame chassis with a unique one-piece construction design concept combining unconventional craftsmanship techniques to create an impeccable artistry. The new gold and black design with detailed aluminum brushed hairline texture made new S-Frame truly luxurious and exquisite. 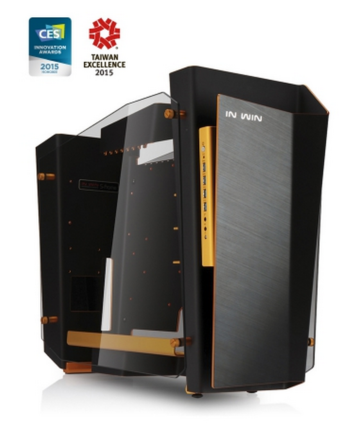 Available now on newegg for $799, Gasp! 1. Microsoft Surface Pro 3: The tablet that can replace your laptop. 7. $99 HP Stream 7 Inch Tablet: This Windows 8.1 tablet includes 1 year of Office 365 Personal, giving you Microsoft Office and unlimited online storage with OneDrive. Normally that software is $70, effectively getting you this tablet for $30! Do you have a website but struggle to drive traffic to it? Are you looking to increase your business’ visibility online? This is where the SEO Management Team comes in. Specializing in search engine optimization, the SEO Management Team can take your website to the top of search engine results pages through effective and affordable SEO best practices. After all, what is the good in having a website if none of your potential customers can find it. Having a site that isn’t optimized can cost you the loss of customers, sales and ultimately revenue. Call them directly at 888-851-0255 to find out more information. Their process is simple and straightforward, incorporating just 3 steps. The team starts with a free audit and analysis of your website. This helps to identify areas that require immediate improvement and optimization. Any underlying website issues will also be identified and corrected at this stage. In order to obtain real measurable results, targeted and precise planning is required to ensure maximum success. This is the core of what SEO Management Team does. Finding the most effective way to improve the performance of your website and it’s rankings through strategic optimization. Each individual client is unique and therefore their business requires a unique approach to their SEO. Utilizing both on-page and off-page optimization techniques, they will get your site where it needs to be — at the top of search engine results pages. Search engine algorithms are constantly changing what it is they deem valuable. Therefore having a team that is ahead of the curve, evolving and implementing their tactics on your behalf is extremely beneficial. The SEO Management Team offers constant monitoring and adjusting to ensure the success of any SEO campaign. Please contact us for more information and to find out how the SEO Management Team can help increase your visibly online, drive traffic to your site and grow your business. 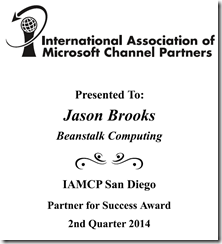 Jason Brooks of Beanstalk Computing was awarded the “Partner for Success Award” for providing excellent leads to other members of the San Diego chapter of IAMCP. The International Association of Microsoft Channel Partners is the preeminent networking venue for Microsoft Partners in the world. 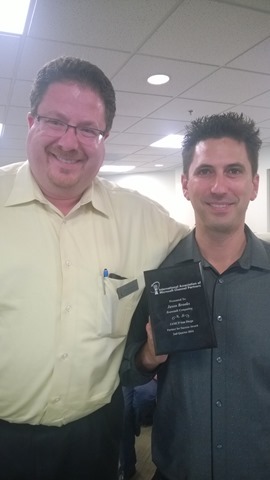 Jason is now a member of the board in the San Diego chapter, seen below with David Gersten – President – SoCal Board of Directors. Beanstalk Computing is proud to present our first whiteboard animation video explaining what it is we do exactly, check it! 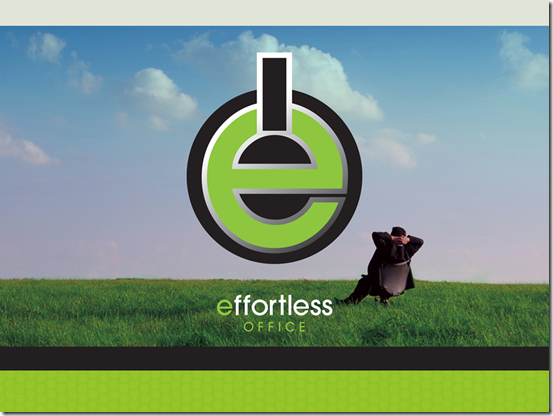 effortless office provides a cloud solution designed to meet all of your security, support, and mobility needs for a fixed monthly price. Your data is stored at the Switch SuperNAP, one of the most secure data storage facilities in the USA. Full redundancy, anti-virus, and spam filtering services are all included in your EO package. With hardware and software that is HIPAA and PCI compliant you can be assured we work hard to ensure you meet industry regulations. 24X7X365 tech support is available to all EO users to ensure all their needs are met in a timely manner. Our tiered ticketing system allows us to answer your most pressing questions in less than two hours. Access your virtual desktop from almost any device in any location with an internet connection. We currently support Windows, iOS, and Android devices. With anytime, anywhere access to your desktop you are able to work when and where you choose. effortless office provides a fixed monthly billing system, giving you the peace of mind knowing what your expenses will be each month. Do not waste time and money sourcing services from multiple companies, let effortless office be your one stop shop for all your IT needs. Please contact us to further discuss your private cloud solution. We offer free no commitment IT audits to show you how you can benefit from a cloud solution.